We’re not really afraid of foreigners or different races, we’re afraid of the poor. No-one is afraid of wealthy foreigners. In fact, because they’re expected to bring investment, they tend to be welcomed enthusiastically. It is the poor who earn our disdain, those who appear to have nothing useful to offer, be they immigrants or political refugees. And yet this undeniable social phenomenon has no name. 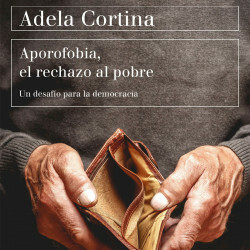 Adela Cortina has thus consulted her Greek lexicon and found the word for ‘poor’: aporos, and coined the name ‘aporophobia’, a trend that is increasing exponentially. In addition to defining and contextualizing the term, Cortina explains human beings’ predisposition towards the phobia and suggests how we might avoid it through education, reducing economic inequality and promoting forms of democracy that take equality seriously and encourage a cosmopolitan hospitality.